Location: Carrigtwohill, County Cork, Ireland. Condition: Restored. Now a popular tourist heritage site. Notes: Barryscourt Castle is a castle located in eastern County Cork in southern Ireland, close to the town of Carrigtwohill. The site on which Barryscourt castle now stands has been occupied for over a thousand years- there is evidence of a wooden watermill having been built next to a stream at the site sometime in the 7th century, long before any fortification existed there. Barryscourt fell into the hands of the Anglo-Norman de Barry family in the 12th century, and masonry from this period found at the site may be the remains of another watermill or possibly an early fortification built by the Barrys. While the de Barry's lands in various parts of County Cork were divided amongst various branches of the family, Barryscourt remained in the possession of the most powerful branch, the Barrymores (Barra mor or "Great Barry" in Irish). The Barrymore line later went extinct, Barryscourt thus passing to a distant cousin, James FitzRichard of the Barryroes (Barra rua, "Red Barry"), in 1556. The present Tower house at Barryscourt was probably built late in the reign of the Barrymores, either in the 15th or 16th century, with a tentative date of about 1550 based on the architectural style, and became the family seat of the Barrys. The Barrys supported the Desmond Rebellions of 1569 and 1579, and in 1581 they destroyed or severely damaged the family castles to prevent English forces from capturing them, including Barryscourt, which was threatened by an army led by Sir Walter Raleigh. 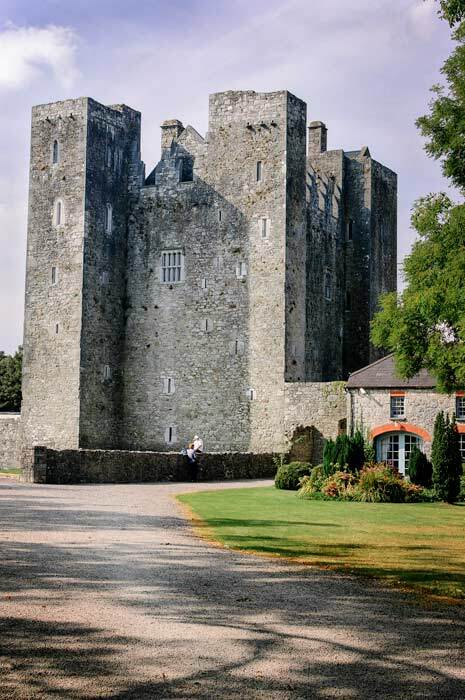 After the suppression of the second rebellion, the Barrys were pardoned by Queen Elizabeth I and Barryscourt was repaired, with an outer wall or "bawn" surrounding an inner courtyard being added, including 3 corner towers. Barryscourt ceased to be main residence of the Barry family in 1617, but was evidently still an important fortification for many years afterwards, as it was attacked and captured in 1645, during the Irish Confederate War. The marks caused by the impact of cannonballs during this attack can still be seen on the castle walls. Barryscourt castle eventually fell into disuse, and a house was built by the Coppinger family (who had taken over the property from the Barrys) next to the castle in the early 18th century; this house has long since disappeared. The Barryscourt Trust was set up in 1987 for the purpose of conserving and developing the potential of the castle as a heritage site. In the 1990s, the relatively intact shell of the tower house was repaired and reroofed by Duchas, and is now a popular tourist heritage site run by the Office of Public Works. The interior is furnished as it would have been in the 16th century. The castle has daily guided tours available free of charge.